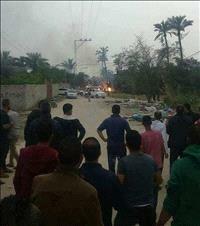 AMMONNEWS - The militant Islamic group Hamas that rules Gaza says six of its members have been killed in an explosion. It says the blast occurred on Saturday night in the central Gaza Strip. Gaza media reported the explosion was a “work accident,” meaning the militants were killed when explosives they were dealing with went off. Earlier, Gaza’s health ministry confirmed five people were killed and three others wounded in what residents said appeared to be an accidental explosion in the Az-Zawayda area of the central Gaza Strip. An Israeli military spokeswoman said she was not aware of the incident. Some explosions in the past in the Gaza Strip have resulted from the accidental detonation of explosive materials belonging to militant groups. Earlier, a group of Palestinians breached the border fence with Israel and briefly entered its territory. It came a day after Palestinians staged a sixth weekly mass protest on the border. The protests are part of a campaign organized by Hamas that is aimed in part at breaking a decade-old blockade imposed since Hamas took control of Gaza in 2007. Since late March, 40 Palestinians have been killed by Israeli army fire.